ringgit.me: Fake Pringles in Malaysia? The photo above was taken at Jaya Grocer. Jaya Grocer is well known for carrying imported goods. They are in the same market as Cold Storage, bringing in imported stuff to cater for the more affluent folks. 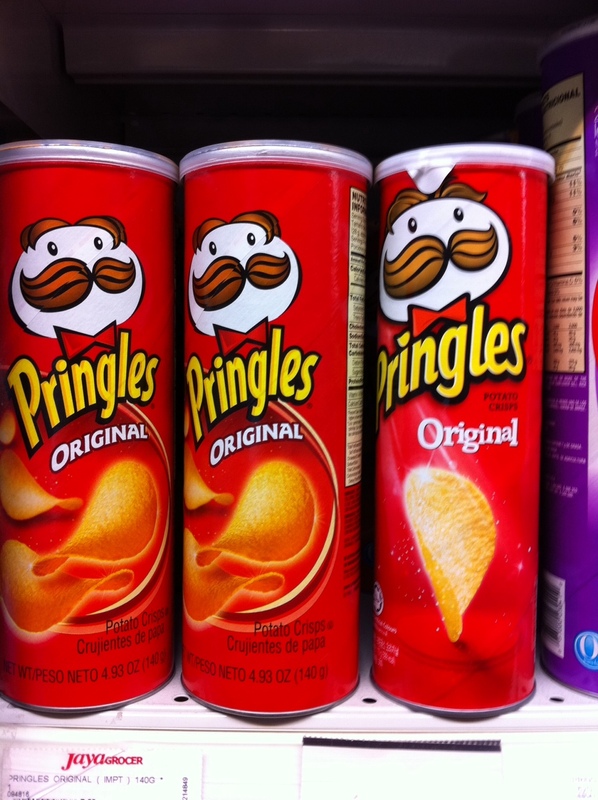 In the photo above, the Pringles can are of the same height but one of them is thinner. The thin one is cheaper by HALF and it doesn't taste like Pringles at all. It taste like Mr Potatoes. It's a local flavoured Pringles. I don't think it is a fake one but I think P&G decided to make it locally to keep the cost down. Otherwise who would be able to eat Pringles? This shows, yet again, how bad our inflation is and how we end up getting more inferior product - just like our condensed milk. I can tell the difference because I ate Pringles for 20 years. I find it unscrupulous of P&G to repackage Mr Potatoes as Pringles and as such I have boycott them. I really like the original Pringles. I also find these Pringles made in Malaysia here in the Philippines, they're just a little cheaper and they tastes nowhere near the original made in the USA pringles. I thought these were fakes being sold in big supermarkets here. Never buy Malaysian Pringles, it's trash. Yes. They dont have the multi linguil writing on the packaging and are made in China! They taste crap. The packaging is plain.